Most of my angling has been in northern New Mexico streams and I primarily fly-fish. My grandson Michael told me one day that he thought I was a great fly fisherman because I always know where to find trout. And one of the many questions I'm asked by people visiting my fly-fishing web site is "How do I learn to read trout water?" Michael's comment was very nice and my response was, "It's simple, it just takes experience." This may seem like a simple task for us seasoned anglers but my answer has always seemed to me to be the appropriate one, then I remembered it took me a long time to learn how to read trout waters searching for fish. Click on the Stream Diagram to the right to see a typical stretch of trout water. Four things trout instinctively need to survive in a stream? A source of food, current flow, a place to hide and opportunity. 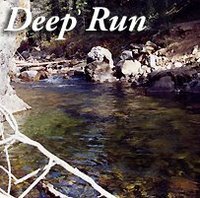 Trout lie near deep runs, deep pocket water and large pools with moderate current flows while occasionally cruising in open water. The colorful hues of all species of trout create a natural camouflage in the riffles and in the reflective movement of the water, even in the clearest water. However, in slower moving clear water and pools the fish will seek cover such as large rocks, downed trees, dark freestone stream bottoms and other debris in the water and the depth of the water. Trout feed on the bottom, middle and on the top film of the water primarily based on the temperature, location of food and the clarity of the water. The bottom will carry nymphs, larvae and worms. The middle will be productive with baitfish imitations such as streamers, spinning lures or emerging insects. And the top will, of course, carry the adult insects that have hatched or are about to hatch. A natural drift of your artificial fly is essential in all cases. The Moon and How To Read Trout Waters Feeding is triggered by lunar position, water temperature and most importantly of all; opportunity. The best time of the day to fish for trout is generally early in the mornings and in the evenings until darkness. During the warmest part of the day trout are often inactive. That's why we all have lunch at noon and take a nap until 2 o'clock. You will note that in the late afternoons and in the evenings trout may be feeding from the top because insects have been hatching after an afternoon of warmer water temperatures. I look at it this way; after the water temperatures raise so do the fish. My experience has been that rainbows are most active in water temperatures between 45 and 52 degrees with German brown trout being most active in water temperatures between 48 and 60 degrees. Above and below these ranges trout appear somewhat disinterested. I have found in many streams browns tend to take a hiatus as soon as the sun covers the water in the late morning and come back in the evenings when the sun moves off the water. However, don't forget, trout ARE opportunistic. Very slow wide shallow pools or shallow flats of water and very fast water are not the best water to fish for trout and I generally pass them over. However, at the tail end of these pools and flats where the water narrows I just can't resist a cast. The best trout water is deep current, which will carry aquatic insects, worms and baitfish in a natural movement through the current. Look for narrow to wide deep runs of water. The fish will be near the center facing upstream, generally slightly angled to the left or right of the center awaiting an opportunity for their next meal. 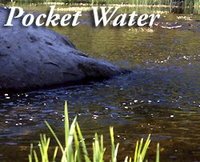 Pocket water is another resource that holds trout. Rocks or debris are usually present to form small to medium pockets of water. The fish lie at the head near the rocks or other cover and at the tail of these pools where the current is stronger. Deep pools with moderate current are also a good location for trout. Rocks and debris also create this type of water, which will form larger pools usually with eddies or effervescent water on one or both sides and usually in the middle for cover. The fish will lie in slower water just below the rocks and at the tail of the pool. 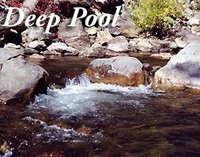 I have come to realize that pools, pocket water and deep runs tend to repeat with very similar structures many times as you travel up or down a stream which helps in reading the stream. Explore when you fish; such as picking up rocks from the stream bottom to see what bugs are present and look for bugs in the air or on the stream banks. Be observant with the activity of the trout you do see and the structure of the cover where they might hide and you will become a more successful angler. Finally, these are guidelines and you should always experiment when you fish and perhaps you will come to some of your own conclusions about fishing for trout. That's how to read trout waters!